Grigor Avagyan is an Information Technologies Engineer. He has 12 years of experience in automation engineering, QA and development. Grigor's expertise includes manual and automated testing, continuous integration and Atlassian products. BDD (Behavior-Driven Development) is a way of developing code based on the expected behavior of the code as experienced by the users. When testing APIs for BDD tests, it’s important to configure BDD correctly and to keep the count of BDDs to a minimum. This blog post will show best practices to configuring the execution of BDD tests through open-source Cucumber, to execute Spring Boot APIs. To run the tests yourselves, you can find the source code here - blazedemo. BDD is a type of software development process where the specification and design of an application are determined according to what its behavior should look like to users. BDD is also known as acceptance tests. There are two sides of the coin when it comes to BDD: on the one hand, it enables non-techie people in the company to contribute directly to test automation. This can be done even in the project’s source code, by giving them a place where they can directly write their criteria. On the other hand, it is very difficult to maintain and support. 1. 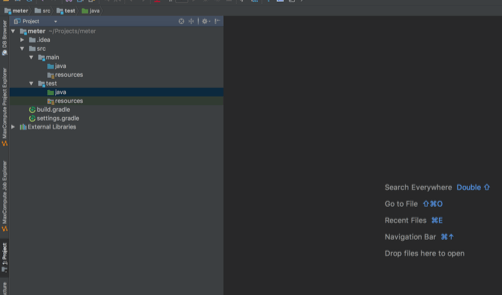 Create a new empty Java project on Intellij IDEA. For more details on how to do that, take a look here (step 1). 2. Now that we have a project, we need to setup the dependencies. You can use these dependencies, since they are public. All the rest are libs/dependencies for the API project itself (including unit and REST assure testing). 3. Install a Cucumber plugin. The plugin can be installed directly from Intellij by going to Preferences -> Plugins -> Install JetBrains plugin. The Cucumber plugin will create/generate/auto-create the JAVA CODE. This plugin gives us two main benefits: code completion in a feature file as well as implementing methods of the feature steps directly from the feature file. The features file is the place for non-techies to write criteria/tests. Keep is as small as possible, with meaningful input only, and include all the steps in it. This is important for making technical maintenance and support as efficient as possible. In the popup you can select “Create step definition” that will create a step definition only for the selected row from the feature file, or “Create all steps definition” that will generate methods for all the steps in the Java classes. For example, if we select “Create step definition”, we will see the step definition class creation popup, which will create the Java class as an output with a defined name and a defined path. As usual, you can store your test files anywhere in the src/test/java, according to your personal preferences. I will group them according to test types: unit, rest, bdd, etc. Don’t forget to name the class for step definitions. Obviously you can do this manually without any Intellij IDEA generation. To ensure smooth running and code readability, it’s important to put all your step definition files in one place. This will enable Cucumber to find the steps and feature files easily. 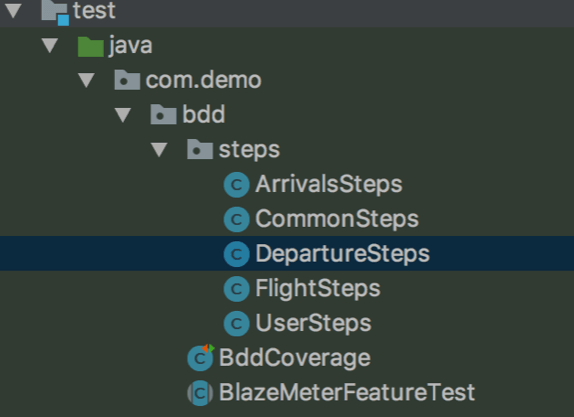 As you can see from the screenshot below, we create a folder named “bdd” and a subfolder named “steps” and put all the testing steps in it. 5. You will receive an auto-generated file from the plugin, which shows the class code with all the steps. Add your code to it, instead of the sample code that will appear in it. Below you can see the part that shows the ArrivalsSteps class. To ensure your application runs properly, create an Abstract Class. The Abstract Class ensures the API runs automatically before the tests, and not separately. In this example, we named the class “BlazeMeterFeatureTest”. The Abstract class that will help us run SpringContext and a random port. As result, all our step classes will extend this one. That’s it! You now know how to run Unit Tests with JUnit for REST APIs. Looking to automate your API tests? Get your API Testing started with BlazeMeter.